You are currently browsing the Ops Portal blog archives. 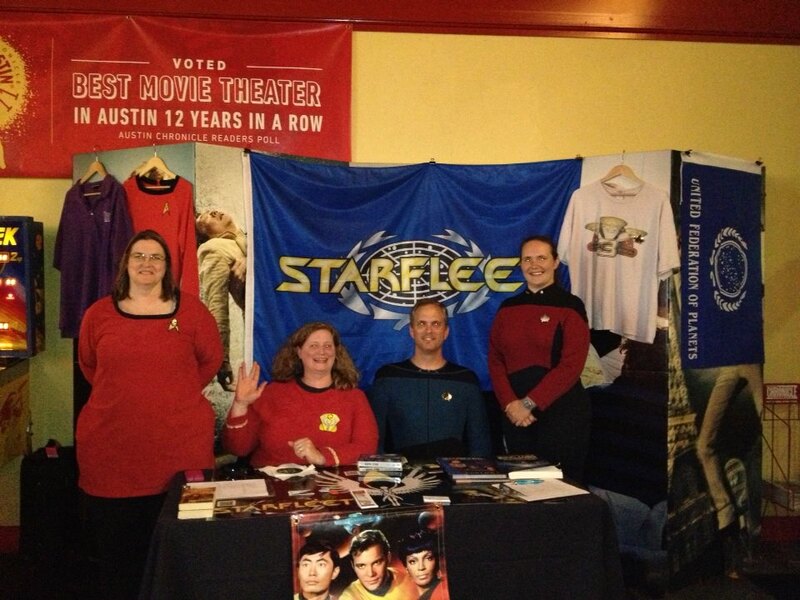 Don’t forget to Register for STARFLEET’s International Conference 2013 to be held in Dallas, Texas August 1-47, 2013. For more information check out the IC 2013 Website. I would like to thank the Alamo Drafthouse Lake Creek location for letting us hang out in their lobby for 2 days. They were great! We had a great time. If you met us and want to chat, then send us an email through our Hailing Frequencies on our main site. From Left to Right: Ark Angel Station Members: Kathy, Reed, and John, and USS Gygax Member Melissa. We looked at the calendar and pretty much the only weekend available for most was Mother’s Day. May 10-12 at a Campground in between Austin and San Antonio. We knew that the USS Crockett would want to attend, so it’ll be a joint chapter event or possibly a Zone event if we get others involved. We’re looking at Potters Creek Park on the north side of Canyon Lake. Anyone been there before? It looks rather promising. Although the Dr. Whovians can’t seem to get their butts in gear, the Ark Angel Station can and is bowling Monday, March 26, 2013, at the Dart Bowl in Austin on Grover. Meet in the Dart Bowl Steakhouse at 7:00 p.m. and we will start bowling around 8:15 p.m. See you there! Please check out the updated Schedule. There are many exciting things for us to do in the coming months. We Rock! We are playing around with this to see if it aides in communications among our members. Stay tuned for more information.